When I moved to Woodside I was looking forward to riding the trails for hours, heading to Robert on horseback for a sandwich, and enjoying its wonderful horsie haven. I pictured myself riding in my mother's hoof prints and living out the stories I grew up hearing. 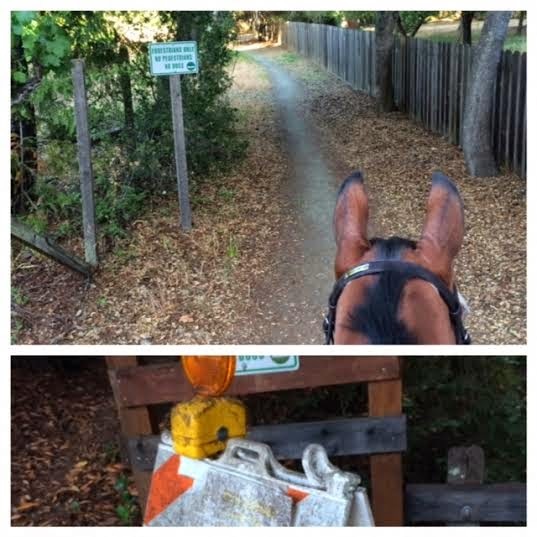 This past Sunday when I ventured out on a trail ride I got a bit more than I bargained for! Like many rides before I started out riding on the trails alongside the road, after checking the map on my iPhone (something mom didn't have on her day obviously) I saw a section that cuts through towards the barn. It was marked non key so I headed down. It dropped me along the river, no big it's only rocks this time of year, and my horse lived on a river back in SoCal. Well that's where the trouble started, after fighting with Ray to get him across I finally dismounted and he very civilly crossed as if there was no issue. Well we ended up having to ping pong back and forth across the river cause it was in a gully and I didn't wanna ride down river rock the whole way. We hit a spot that looked like it headed back to the main road, I decided we should take that so we headed up the bank and hit a keyed gate. The water let up almost as quickly as it started, and I dead ended at a culvert with a washed out concrete crossing. Looking up, down, and all around me I quickly realized I was on a giant ominous private property with concrete fencing and scary gates. After freaking out a bit I decided to dismount, pick our way back the way we came, avoiding the deep water and practically dragging Ray the hell outta there. When I got back to the trail head where this all started I noticed a sandwich board with a sign covered in dirt, saying trail closed due to damaged water crossing. Sure woulda been nice to have known that BEFORE I entered in the scariest ride of my life! All in all we survived just fine, aside from a few scuffs and scratches on my new boots, and a stab wound on my knee we were lucky. Moral of the story is Ray and I are not cut out for trail riding off the beaten path, I'm just glad I didn't also have the corgi strapped to my saddle like most rides! I still love my little town, but I think I am going to stick to the arena for a while. Yellow font on a white sign, I think it was perfectly legit that I didn't notice it. footnote: I later Googled the property, it's 23 acres, worth $27 million and rumored to be owned by the Gates. So theres that. Is it still a party if they don't know you're there? At least I hope they didn't! Yea, Woodside has it's interesting quirks.. Yes lets definitely party with the Gates.